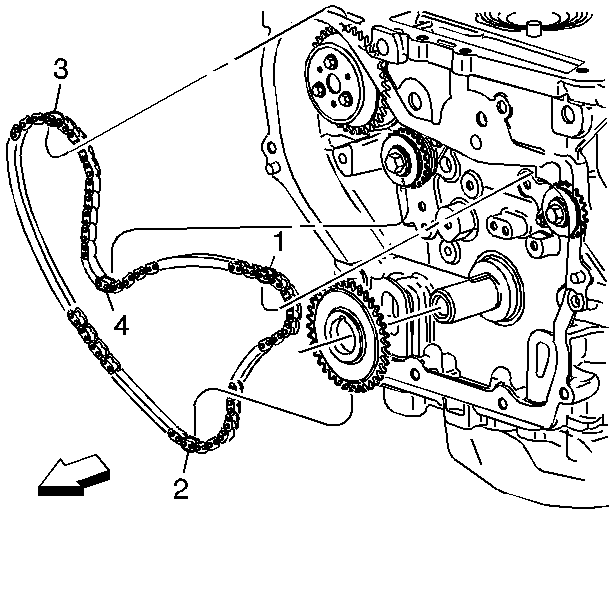 Install the balance shaft drive sprocket. Note:If the balance shafts are not properly timed to the engine,the engine may vibrate or make noise. Orient the chain so that the colored links arevisible. Place the uniquely colored link-(1) so that itlines up with the timing mark on the intake side balance shaftsprocket.Working clockwise around the chain, place the first matchingcolored link-(2) in line with the timing mark on thecrankshaft drive sprocket, approximately 6-o'clockposition on the crank sprocket.Place the chain-(3) on the water pump drivesprocket. The alignment is not critical.Align the last matching colored link-(4) with thetiming mark on the exhaust side balance shaft drivesprocket.